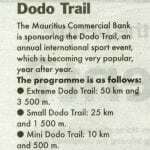 Après un trail… y a toujours des mécontents, sauf sur le DODOTRAIL ! 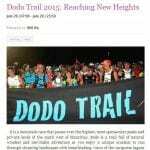 Dodo Trail’s first edition was held on the 30th July 2011 with more than 350 participants. Three fabulous track were offered, crossing the island from South to West. 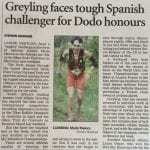 An ultra trail of 80 kms at la Cambuse. a ti trail of 33 kms beginning at Pétrin, and a Mini trail of 10 kms beginning at Yémen all ending at La Pirogue Hotel, on a beautiful beach of the west coast.